Gold prices are on the bid for the third straight day as the Dollar remains in the defensive ahead of the Fed meeting. The Dollar index is facing deeper losses as the US Fed is widely expected to keep rates unchanged on Wednesday and signal less inclination to hike rates in 2019. The dovish Fed expectations, however, seem to be boding well for the equities as they are reporting gains. This fact could hurt the demand for the yellow metal and that is the reason why gains are still capped. Gold prices edged higher this morning after being capped below the $1305 level to reach the $1307.09 resistance level. However the price could not hold up on top and the retreated quickly and is now trading just above the $1305 level. 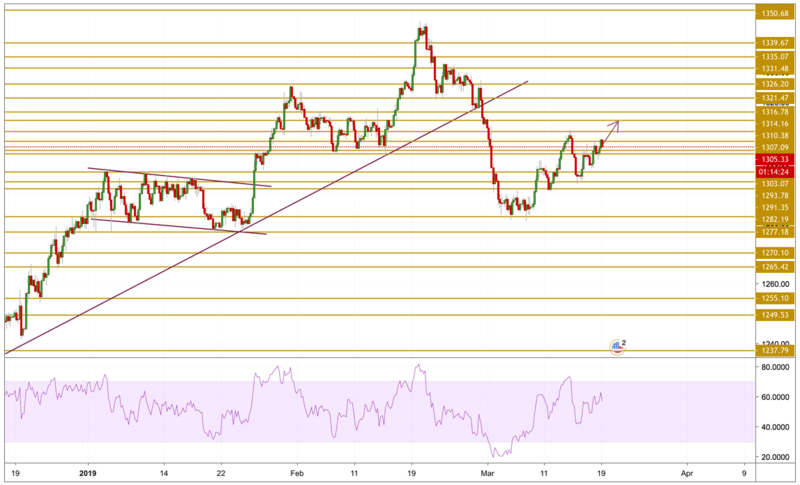 Gold needs to pick up a stronger bullish momentum in order to break to the upside and the next level we will be watching is the $1314.16 resistance level.